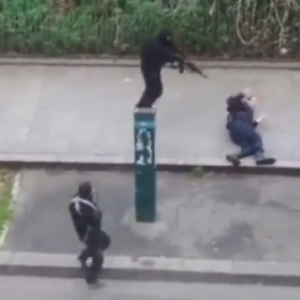 PARIS — Three masked gunmen who shouted the Islamic saying “Allahu Ahkbar” gunned down twelve people on Wednesday at the office of a French satirical newspaper that has been known for publishing cartoons mocking the Muslim prophet Mohammad and other Islamic figures. According to reports, the attack occurred at approximately 12 noon local time at Charlie Hebdo, a weekly publication with offices in Paris. In 2011, the newspaper was firebombed after publishing a caricature of Mohammad as its cover piece, and the following year, after Charlie Hebdo published additional cartoons mocking Mohammad, the government closed its embassies and schools in over 20 countries out of fear of retribution. This week’s issue featured an Islamic caricature entitled “Still No Attacks in France,” which included a drawing of a Muslim fighter declaring, “Just wait—we have until the end of January to present our New Year’s wishes.” Just moments before the attack, staff at Charlie Hebdo Tweeted a cartoon featuring ISIS leader Abu Bakr al-Baghdadi, who issued best wishes for the new year. Cartoonist Corine Rey told the publication Humanite that she was forced at gunpoint to let the men in the building. Stephane Charbonnet, one of Charlie Hebdo’s editors who has faced death threats in the past, as well as a cartoonist, were killed in the attack, in addition to eight others. Two police officers were also killed in a standoff outside the building. Five other people were injured. The gunmen then took off in two separate vehicles, and a manhunt is still underway for the assailants. One of the vehicles has been found abandoned. France has now raised its terror threat level following the attack. The incident is the latest in a string of violent attacks in France in recent weeks. As previously reported, a Muslim man attempted to strangle a police officer in France on Friday while yelling “Allahu Akbar.” Last month, in the city of Joue-les-Tours, 20-year-old Bertrand Nzohabonayo also entered a police station with a knife and began attacking officers while yelling the common Islamic saying. Reports also state that days afterward, a man plowed the vehicle he was driving into a crowd in the city of Dijon, injuring thirteen. He also yelled “Allahu Akbar” and “for the children of Palestine” as he committed the act, although prosecutors claim that the man was mentally ill.
“We are all concerned about this series of tragedies,” French Prime Minister Manuel Valls told Reuters.